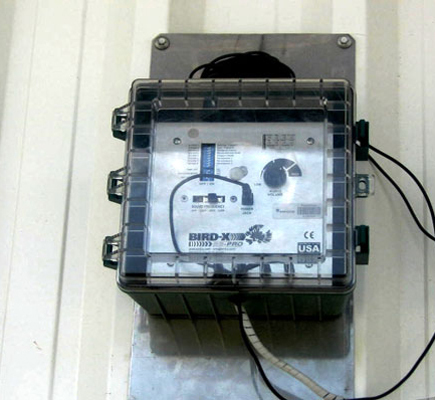 The Broadband PRO from Bird-X uses the distress calls of specific species of birds, harrassment sounds and high frequency near ultrasonic sound waves that birds simply cannot tolerate and visual scare devices to create a multisensory barrage which will ensure your bird problems cease to exist. It is like getting 3 electronic products in 1. 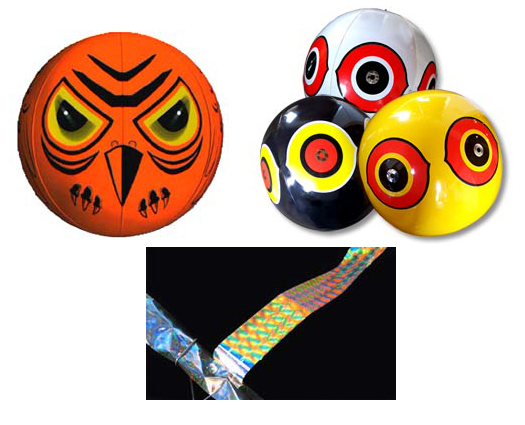 For added efficacy the optional VIS-PAK includes 3 visual scare products. BroadBand PRO deters birds with sounds, but it doesn't harm them. 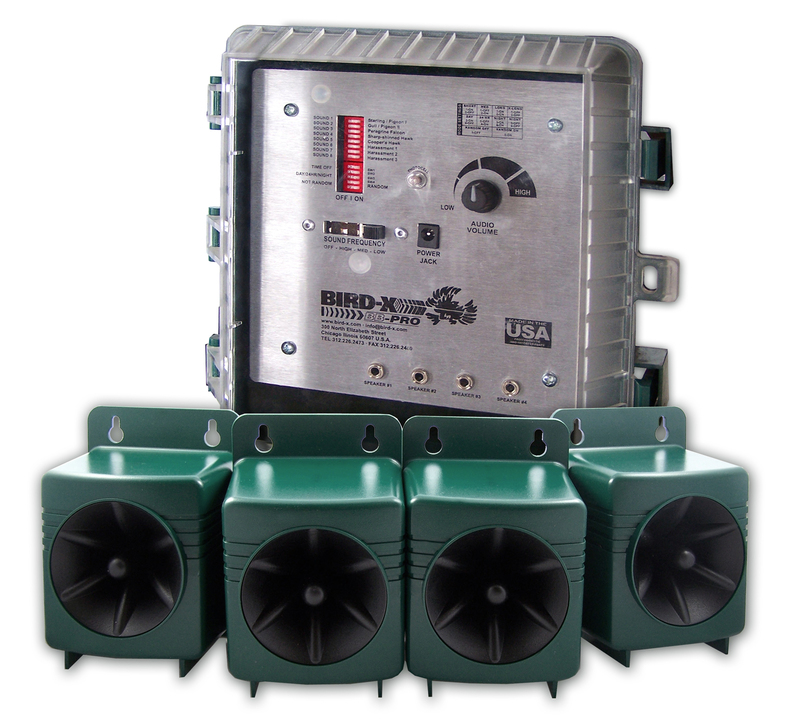 BroadBand PRO has been developed by BIRD-X, the worldwide leader in bird repellent products and systems. Wrigley Field in Chicago has deployed these units and experienced great success. 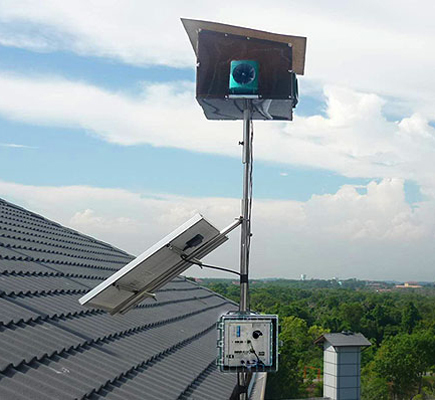 Installs easily – mounting hardware included. Sonic and ultrasonic sounds sequence through all four speakers. Sonic sounds play according to the programming options you choose. Ultrasonic sounds are always active – day and night – regardless of programming, however they won’t play during the sonic sounds. NOTE: ALL bird control methods prove more effective when different types of products are used in combination. Customer Satisfaction Guarantee: BirdXCanada offers a 90 day Customer Satisfaction Guarantee on this product (with the exception of the Viz-Pack) less a restocking charge. In certain cases the restocking charge may be adjusted depending on the condition of the product and the amount of time required to restock the product. In cases where the product or its inclusions (including the product box, inclusions, cables, adapters, manuals, etc.) is damaged either cosmetically or functionally, there may be an additional restocking fee (as it will require repair, repackaging, refurbishing or new packaging before it can be sold again). In all cases the customer is responsible for all shipping charges (both on the initial shipment and on the return shipment). The restocking charge is a minimum of 15% if the RMA is requested within 30 days of the invoice date, 25% if the RMA is requested within 60 days, and 50% within 90 days. After 90 days there is no return policy, but there is a 6 months (from purchase date) manufacturer's replacement/repair warranty. Extended warranties are available; inquire if interested. 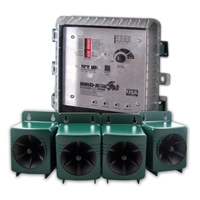 Dimensions: Control Unit 8" x 9" x 5"
Speakers 3.34" x 4" x 5.75"
NOTE: Noisy environments can reduce the coverage of the product, call for more information. What is included: Control unit, four speakers with 100' cords, mounting hardware, Instruction Manual. Optional VIS-PAK includes 100' trial kit of Irritape, a Terror Eyes and a Scare Eyes package.